Spring has finally sprung at our home, although the weather is still chilly. A week or two ago we got a little head start and placed all the pots in their place and filled them with the potting soil. We placed the furniture around and waited for a good time to actually do the planting. As you may remember, we can’t do any decent plantings off of the deck as the deer and groundhogs gobble them up in a day or two. 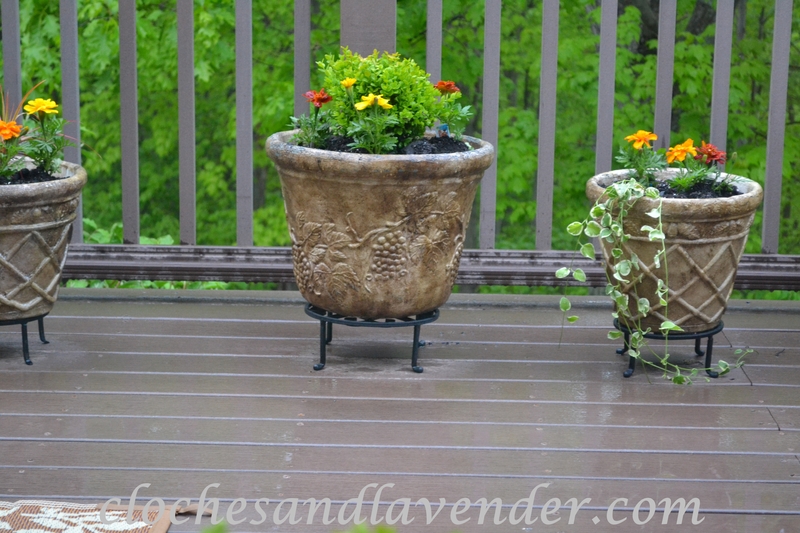 Mostly all of these pots were hand finished, as they started out as basic inexpensive resin (green or terra-cotta). I did a faux aged stone effect with paint and water and coated them with a poly. Over the years they have weathered nicely and still maintain that antique look. (People always want to buy them when we have the town garage sale LOL). 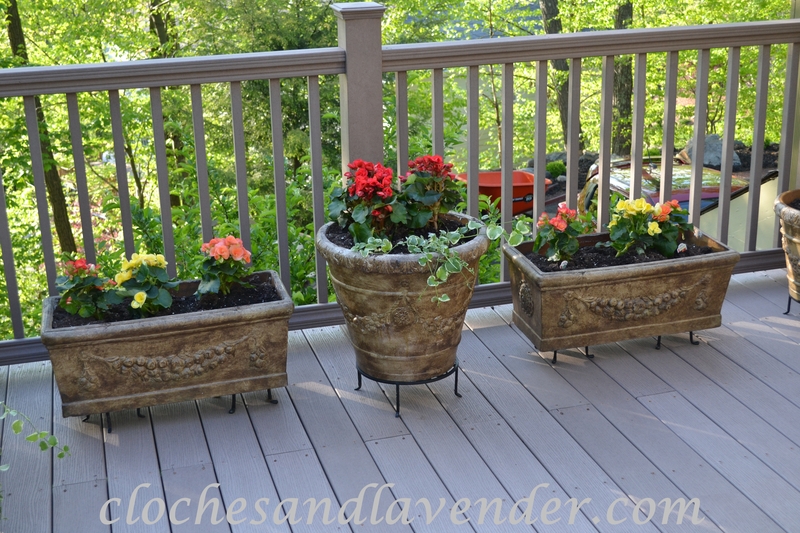 So, our deck is now filled with all our young flowers and herbs in their assigned pots, along with that finial I spoke about and my tea-cup planter that I found. I look forward to making my Gravy (sauce lol) and pesto using my fresh basil cuttings. Our outdoor furniture is new this year and I just love it and the lovely outdoor rug placed under the seating area. I think it brings some warmth to the arrangement. I also decided to use some small boxwood this year, so in the winter I can leave them out on the deck and have some greenery all year round. I love the play of color with the marigolds with the boxwood it is nice and colorful. This year I am trying miniature butterfly bushes and as they progress in size I will take more pictures, hopefully with butterflies and hummingbirds. They come back every year as they go dormant for the winter months. I love perennials every summer it is a surprise to see how much bigger they are every year. 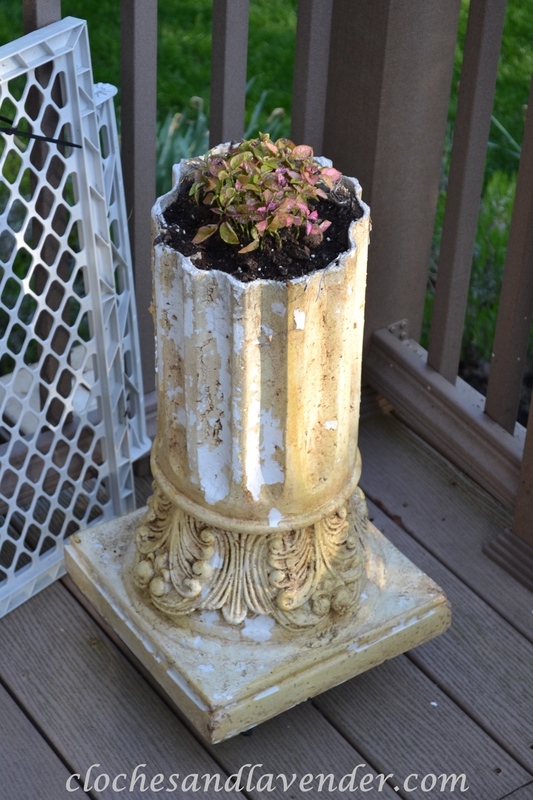 I also planted these begonias that you see in pots some with Vinca vine as well. I love the foliage on them and the flowers as well, the colors are very pretty. 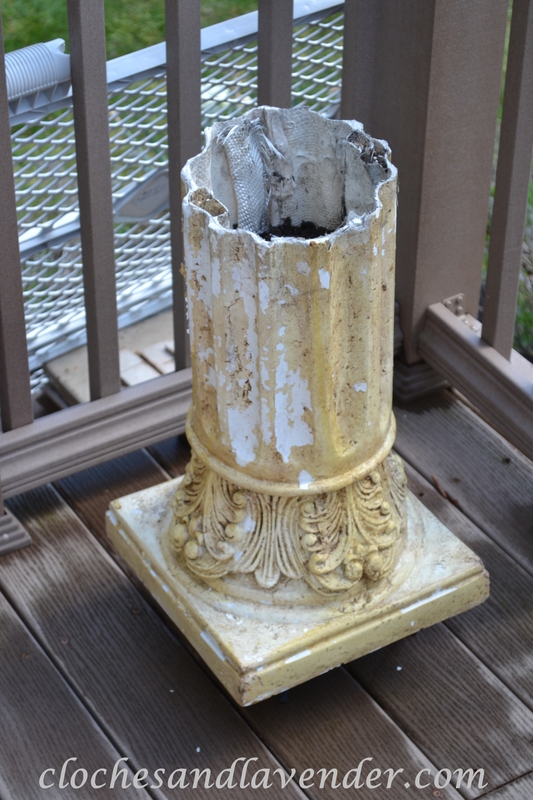 I am on the hunt for a few more finials for the deck area and when I find them you will see them as well. I know what I want I just haven’t found it yet. 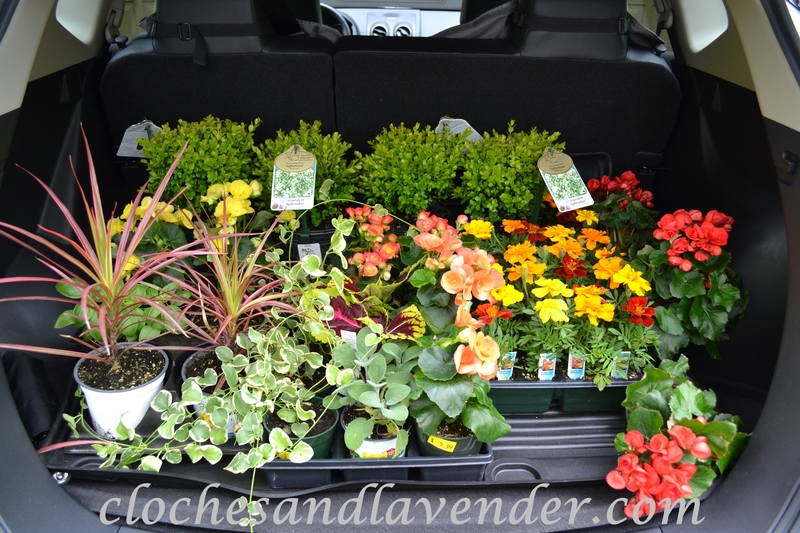 Your back of the car is a lovely garden in and of itself! What a pretty deck you have. I can just imagine sitting out there and enjoying the summer evenings with the smell of all of your beautiful flowers. 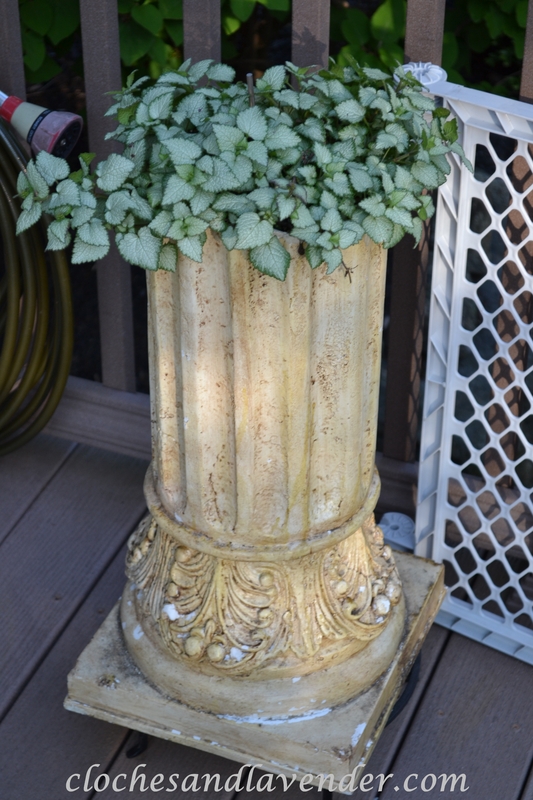 You are sooooo clever to have saved those columns and used them for planters. I wish I had a couple of columns like that. 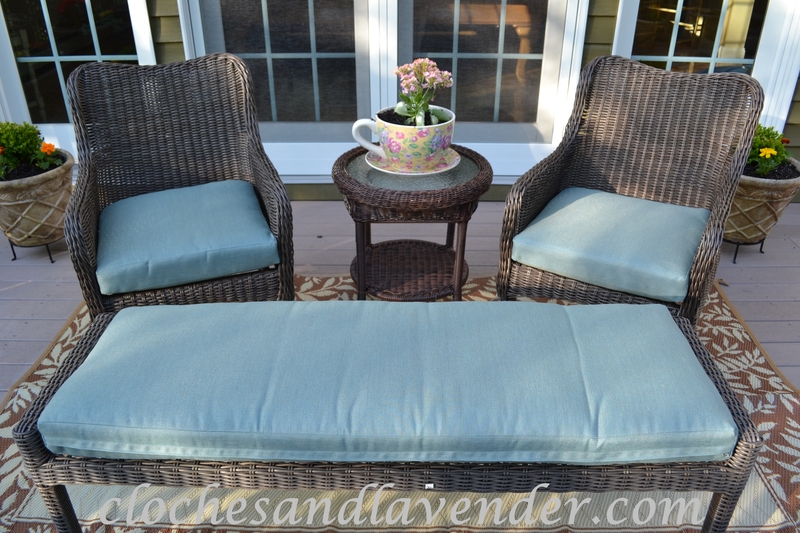 The new furniture is so pretty too and it is grounded beautifully with your outdoor rug. Enjoy a summer full of a beautiful area to relax! 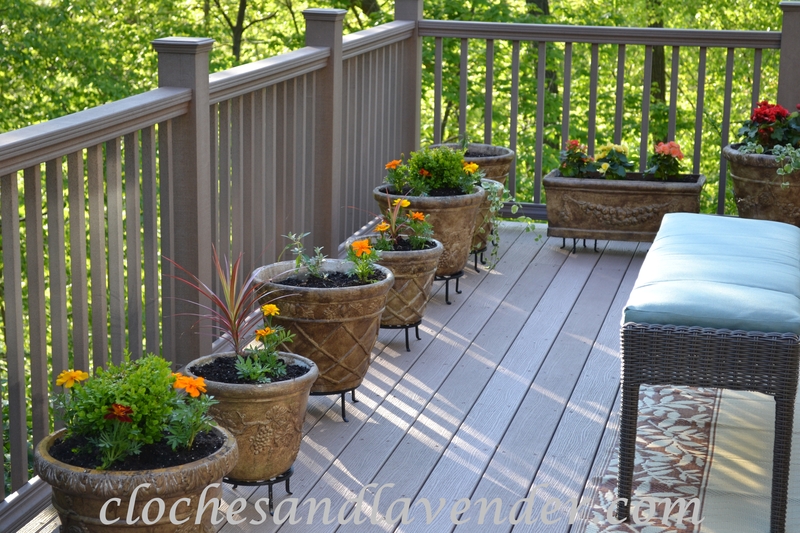 Your deck looks amazing with all those patio pots! I don’t know if I would have time to water everything before heading off to work in the morning. I started getting my annuals last night, but it is suppose to rain most of the week so I hope on Saturday to be back in the garden. 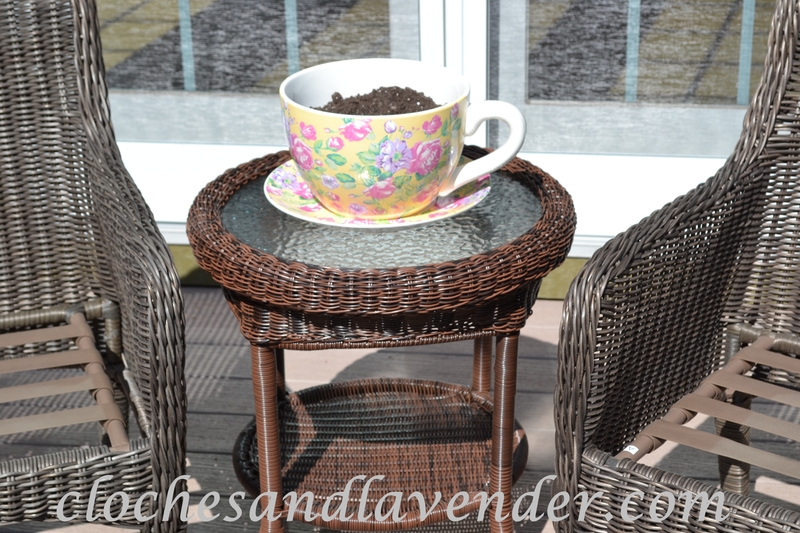 May I ask where you found your gorgeous teacup planter? You have created such a wonderful place to sit and relax. I found the tea cup planter at a store by my house. I thought I got the teacup planter by my house but last night I remembered I bought it online. For the life of me I can’t remember where I got it from but I know I Googled teacup planters and they came up. Sorry I gave you the wrong answer yesterday. I have a lot going on right now. 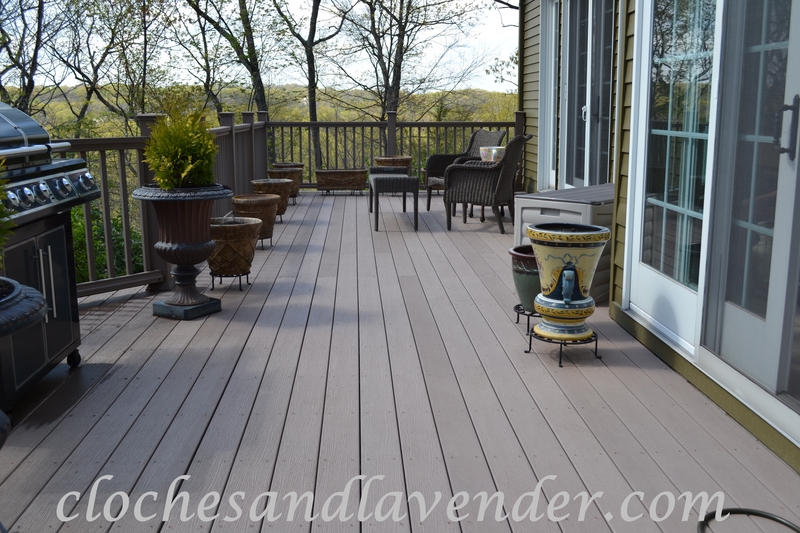 Your deck is looking amazingly colorful! I have a hard time resisting plants at the nursery as well! I am following your page now. Thank you for your comment. Take a look around. Looks like a wonderful summer season ahead for you. Everything looks so pretty and inviting. Thank you as the flowers progress I will take more pictures. What a lovely place to chill out! Your deck is absolutely a beauty. Love all your pots. Hmmm… I guess I will do some copycats here. How about the outside carpet? Is it plastic so, when it rains, we don’t need to roll it in? I am really interesting, as I have an open deck too. I found it so boring now. It’s bare when only the outdoor set, stand alone. Believe of not the rug is plastic and when it rains it does dryout rather quickly. Thank you for checking out my blog be sure to take a look around. Your deck looks gorgeous! Love all your pots and pretty flowers! This looks so inviting! 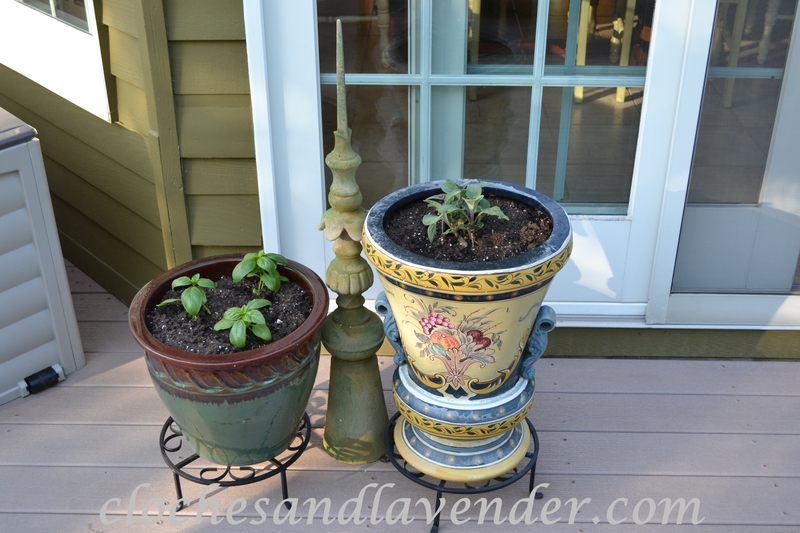 I love the way you finished the pots to look antique. They look beautiful with the multi colored flowers you chose. Your new furniture is perfect for that beautiful deck. This all looks so beautiful, I love your veranda, and the pictures of the plants all ready to be planted up at the beginning 🙂 It looks beautiful, bright, simple and calm, perfect for relaxing outside with a book and cup of tea I expect! It is perfect for that cup of tea or iced coffee depending on my mood. I love the way our flowers turned out this year. It is funny I was just looking at your blog and getting ready to comment. Your deck is soooo beautiful! Everything looks so neat and inviting. You really know how to arrange the plants to compliment one another. Stunning view from your beautiful deck! I love all the pops of color the plants add. 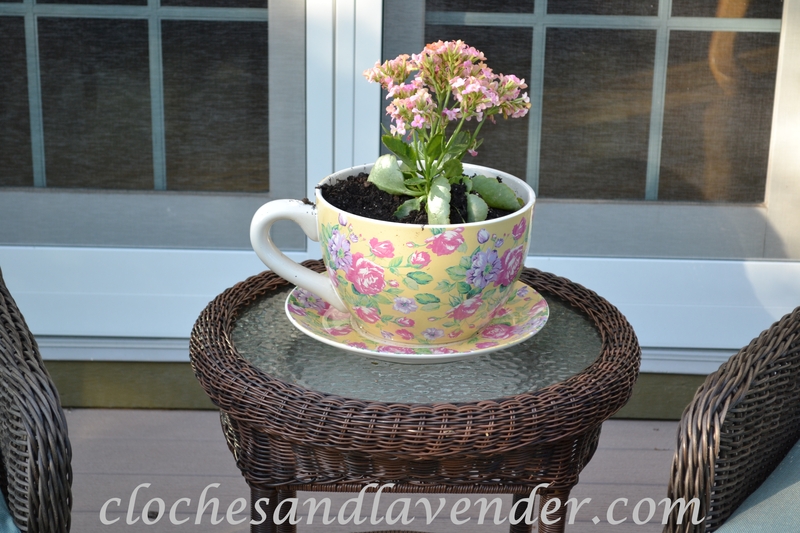 The teacup planter is so cute! I wish I could come over and see everything in person! 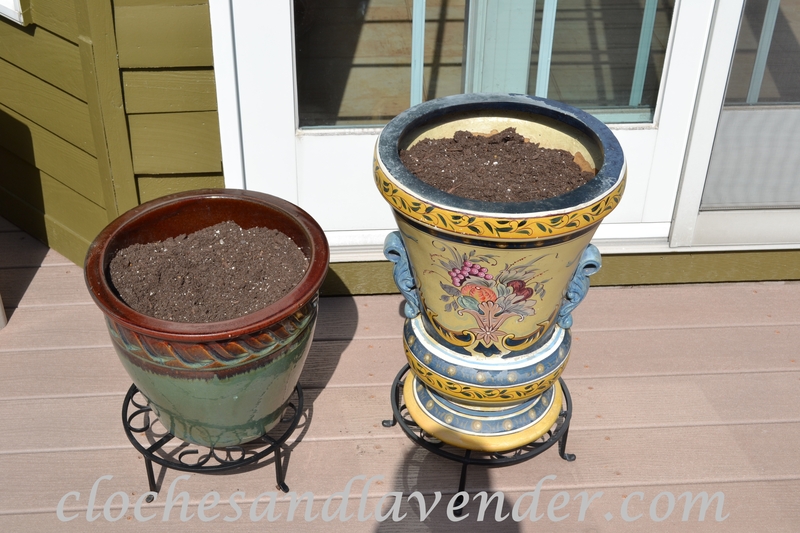 I love gardening…I picked up a tip from you today…getting the soil ready in the pots before you buy the plants. I also needed an idea for a pot for my plant that is on my little side table…I’m going to be looking for a teacup planter now. You’ve also inspired me to get some herbs to plant in some of my empty pots. I’ll be asking you for tips and advice when I do that. I got the teacup planter on line and for the life of me I can’t remember where. Just Google teacup planter. 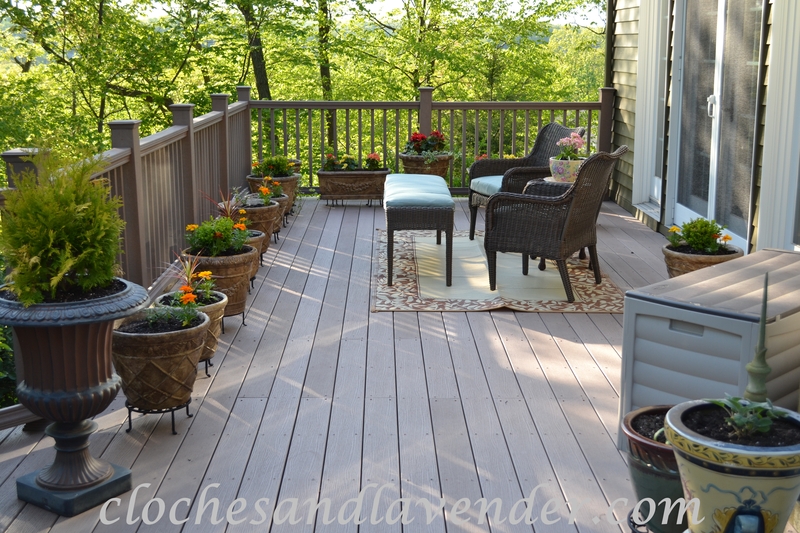 I love how our deck turned out this year and as things grow I will be posting updates. Thank you very much for following my blog I check yours out everyday. You have a great blog! Happy to follow along. Thanks for supporting mrs. hines class! Thank you for hosting I follow your page a lot. 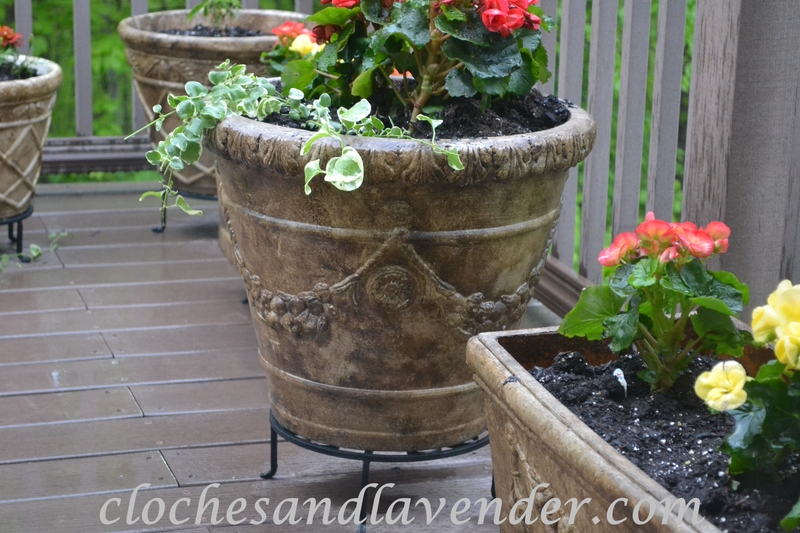 Hi, I just came across this on your blog and I was wondering what color paints you used for your planters to give them the aged look? I didn’t see a tutorial and I would love to do mine that color. Will it also work on concrete planters? Thank you. I used a mixture of raw umber and burnt umber paint and water then spray with poly. Thank you. I will give it a try. Merry Christmas.